With more than 10 airlines operating services from Manchester Airport Terminal 3, millions of travellers will be starting their trips from this busy international facility – with APH on hand to provide a drama-free departure day for all. Booking parking at Manchester Airport Terminal 3 through APH not only means one less thing to worry about as the big day approaches – but it also the reassurance your car will be properly cared for while you travel. Of course, finding the right parking for your trip from Manchester Airport Terminal 3 isn’t as simple as a one-size-fits-all solution, so let us guide you through the options and help secure your perfect match. With top-rated services such as Manchester Airport Multi-Storey Terminal 3, boasting a 9.4/10 rating, and APH Car Park, with its customer-satisfaction rating of 9.3, we’ve got the best parking at the best prices. Taking a look through the following sections will help you select the best Manchester Airport Terminal 3 parking for your journey from this busy international facility. Selecting the correct parking for your trip will help ensure departure day is as stress-free and efficient as possible. 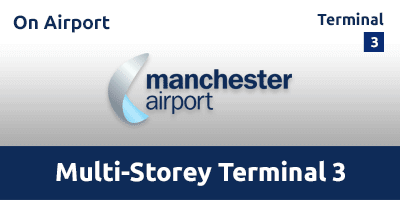 APH offers a wide range of services covering parking at Manchester Terminal 3. From the budget-friendly park and ride option provided by the likes of our very own APH Car Park to the rapid-access ease of on-airport services such as Manchester Airport Multi Storey Terminal 3 and the VIP luxury of meet and greet from providers including Meet & Greet Terminal 3, we’ve got your parking space ready and waiting. Take a look at the following table for an overview of Manchester Airport Terminal 3 parking available through APH. With millions of travellers searching for parking deals at Manchester Airport Terminal 3, it’s inevitable that a small number of rogue operators will attempt to profit by undercutting legitimate firms. Choosing these ‘firms’ might save a few pounds, but could also result in vehicles being left in peril on dangerous city streets, public car parks or derelict wasteland. The Park Mark Safer Parking Award can help ease the fears of travellers looking for legitimate parking that serves Manchester Airport Terminal 3. Holders of the award provide police-approved parking that’s safe for both vehicles and travellers, alike. Parking offered at Manchester Airport Terminal 3, such as our own APH Car Park, provides travellers with the reassurance of being part of the Park Mark Safer Parking Award scheme that helps travellers book safe, legitimate services. The Park Mark Safer Parking Award ensures travellers flying from Manchester Airport Terminal 3 can park and fly without concerns over safety. As a Police Crime Prevention Initiative, the Park Mark Safer Parking Award is designed to cut crime or the fear of it in car parks across the UK. APH is a committed supporter of the Park Mark Safer Parking Award and its mission to deliver safe, legitimate Manchester Airport Terminal 3 parking to all who travel from this busy international facility. Look for Park Mark Safer Parking Award-holding car parks on the official Park Mark site here. Alongside the Park Mark Safer Parking Award, APH provides genuine customer reviews for all products we sell. Travellers can use these to find honest, easy-to-read verdicts on the service offered by Manchester Airport Terminal 3 parking providers booked through APH. All reviews are collected and published through independent provider Reevoo to ensure travellers get a full and uncensored overview of the company. Reevoo guarantees reviews published on the APH website have not been edited or specially selected to deliver an unrepresentative impression. Reevoo gives you the full picture. 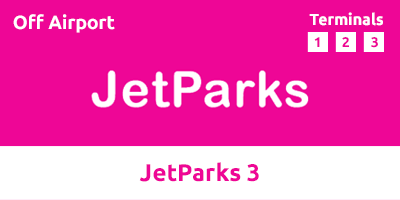 Check out reviews for services – such as Jet Parks 3 – that cover Manchester Airport Terminal 3 parking. Here at APH we’re not simply committed to providing safe and secure Manchester Airport Terminal 3 parking, but also doing so at the best price possible. With that in mind, we look at real-world tips and strategies to help travellers cut even more from the cost of their parking at Manchester Airport Terminal 3. Obtaining real savings on parking bought through APH is simple and fast! In fact, we can offer at least 10 per cent off your Manchester Airport T3 parking without the need to move from where you’re sitting! 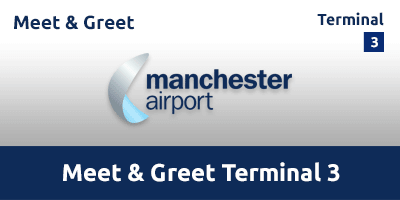 Secure your personal discount right now by scrolling to the foot of this web page where you can enter your email, hit the join button and enjoy a 10 per cent saving on all Manchester Airport Terminal 3 car parking we offer. Looking for more savings to boost your spending power? Not a problem – read on to find out how a little pre-planning could reward you with huge savings on Manchester Airport Terminal 3 parking. Parking prices fluctuate throughout the year, with periods of high demand seeing prices peak. But that doesn’t mean you can’t save money on parking – with the likes of Manchester Airport Multi-Storey Terminal 3 – when booking through APH. With four decades of airport parking experience, we’ve accrued in-depth knowledge of pricing and how selecting the right time to book can significantly cut the amount you’ll pay compared with other times. APH is happy to share this data to help customers get cheap Manchester Airport Terminal 3 parking whenever they travel. Analysing our exclusive data allows us to accurately forecast the average price for Manchester Airport Terminal 3 parking depending on how far ahead of departure it's booked. This data typically reveals reservations made six months before departure are likely to bring the most significant savings. Our data shows booking Manchester Airport Terminal 3 parking around six months prior to departure could be in the region of 62 per cent cheaper than reservations made just a week before flying. While it’s not possible for all of us to book parking six months out, making your reservation as soon as possible will typically offer a useful saving. 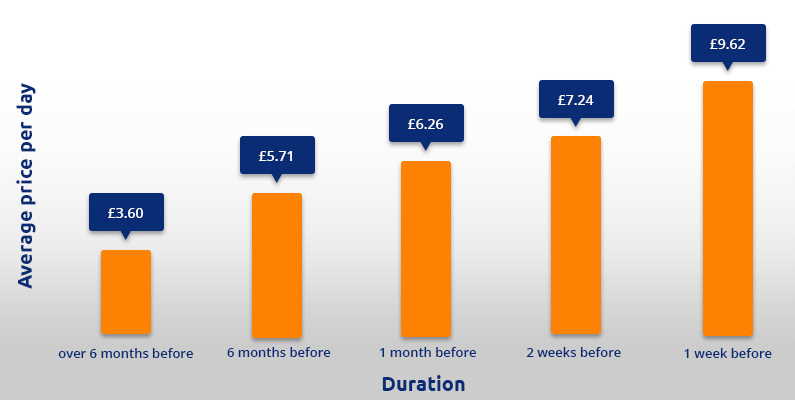 Take a look at the data below to calculate potential savings achievable by booking early. Anyone looking to cut the amount they’ll pay for Manchester Airport Terminal 3 could also consider park and ride services – including our own APH Car Park. This is safe, secure parking at a price that’s among the cheapest available. Here’s the parking we currently offer at Manchester Airport Terminal 3. Here we explore parking options available to help travellers select the perfect solution for trips from Manchester Airport Terminal 3. Here’s our at-a-glance guide to the various types of parking, followed by an in-depth explanation. On-airport parking from providers such as Manchester Airport Multi Storey Terminal 3 offers safe, security-protected parking just a short stroll from the check-in desks. Using it is easy, too. Drive to the car park, find a space before taking the short walk to the check-in area. Drivers get to keep their keys – with cars remaining in their original parking space while you are away. All of the on-airport parking facilities sold though APH are fully security-protected and recipients of the Park Mark Safer Parking Award. Best for: Anyone who wants fast, legitimate parking just seconds from Manchester Airport Terminal 3 should look no further. Mid-priced parking that leaves nothing to chance. Cost-effective parking that doesn’t cut corners when it comes to safety and security. With our inventory of off-airport car parks located no more than 10 minutes’ transfer from Terminal 3, services such as APH Car Park offer a reliable and highly cost-effective solution for Manchester Airport Terminal 3 parking. Just drive to the car park, check-in, unload your bags and take one of the regular buses heading to and from the Terminal 3 check-in desks. Expect the likes of CCTV, security fencing and barriers with manned patrols both day and night. 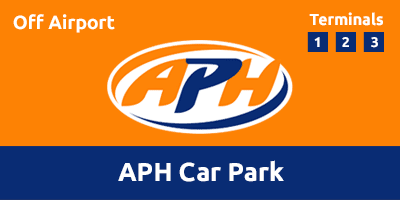 Most off-airport park and ride services offered through APH hold the Park Mark Safer Parking Award. Best for: Looking for safe, budget-friendly airport parking for Manchester Airport Terminal 3? This is the airport parking service for you. The ultimate parking solution for that VIP start to your trip from Manchester Airport Terminal 3. There’ll be no need for off-airport car parks, or busy transfers to the check-in area – simply drive directly to the terminal. Once there you’ll be met by a fully insured driver who’ll park your car while you check-in. Cars will be parked in a security-protected car park for the duration of your trip. All meet and greet services offered through APH are holders of the Park Mark Safer Parking Award. Best for: Great for passengers travelling with young children, mobility issues or bulky sports gear such as surfboards and skis. Stress-free parking for Manchester Airport Terminal 3 that could save you up 45 minutes from the start and end of your trip. Skip the early morning alarm calls and uncertainty of rush-hour travel by booking a hotel for the night before – or after – your trip. Pairing parking with a hotel room can often add just a few pounds to the amount you’ll pay. Find out more about hotel and parking packages at Manchester Airport Terminal 3 and how one could provide the perfect stress-free start for your next trip. Get ready for your journey from Manchester Airport Terminal 3 by preparing a route to your car park or meeting point. Use the map on this page to help ensure you arrive at the check-in desk with plenty of time to spare.